The classic Chanel jacket. Mama like. 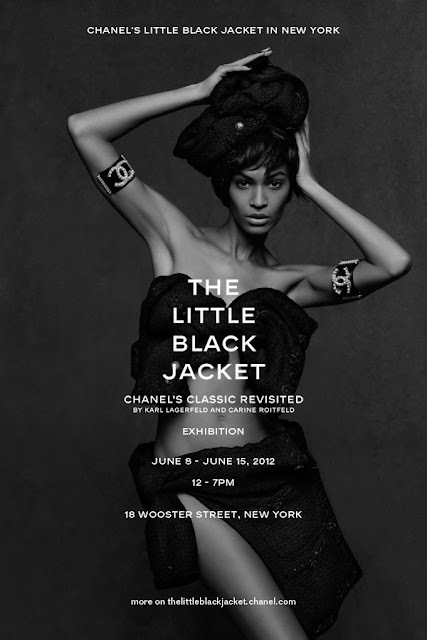 In advance of the book The Little Black Jacket: Chanel’s Classic Revisited by Karl Lagerfeld and former French Vogue editor Carine Roitfeld, which will be released on August 15, 2012 (my birthday! ), there is a micro-exhibit on the iconic black Chanel jacket from June 8-15 in Manhattan. I’m so there. I will report back if they allow me to take photos. I tried this jacket on once at Saks. It was a little piece of fashion heaven. The exhibit poster featuring Joan Smalls. What a cool way to celebrate your birthday! I hope they will allow pictures, cannot wait to see! Do I dare ask what that Chanel jacket might have cost at Saks? I keep looking for something like them at the thrifts--nada. And what a great way to celebrate your birthday. They must have known. You DO love Chanel, don't you? Me, too! The black jacket is pretty darn gorgeous! Strange thing tho, I have no qualms about spending $ for Chanel bag, but I've never been able to buy Chanel RTW. I just can't pull that trigger...not even when they're on sale. Go figure? What a short runtime they have! You have to be quick to see it. Do you believe there are body-shapes that don't work with the jacket? Coco Chanel's shape was different from many other female shapes. I for example have a high waist and low bust and a really short torso. The Chanel jacket would shrink my torso even more and make my delicate waist dissapear. Which would be not a good idea.